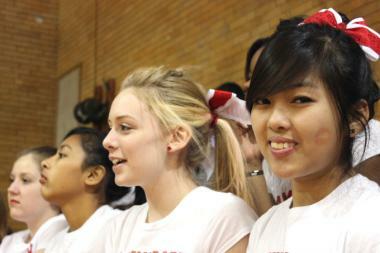 Amundsen cheereleaders root on a performance by the school's poms squad. CHICAGO — More students at four high schools will get a chance to participate in the International Baccalaureate program in the fall, giving them an opportunity to get a jump on college through the academically rigorous program, Mayor Rahm Emanuel said Friday. Amundsen High School, in Lincoln Square; Curie High School in Archer Heights; Kennedy High School in Garfield Ridge and South Shore High School will add additional International Baccalaureate classes, the mayor's office announced. The expansion makes good on Emanuel's promise to ensure that 50 percent of students in Chicago Public Schools earn college or career credit before their high school graduations, according to a statement from the mayor's office. Since 2011, the number of Chicago students enrolled in International Baccalaureate classes has quadrupled, the mayor's office said. Those students have a 100 percent graduation rate, and 81 percent enroll in college, a much high rate than their peers nationally — and citywide, officials said. The International Baccalaureate program offers what CPS describes as "a challenging and academically advanced curriculum" for accomplished and highly motivated students. Emanuel has expanded CPS' International Baccalaureate program to give parents of high-achieving students another option besides the extremely competitive selective-enrollment high schools. The deadline for applying for selective-enrollment and magnet schools is Dec. 9.